I had a good chuckle over the new content at Microsoft’s Open XML Community web site. Please take a look. What it lacks in accuracy it makes up for in the use of shiny graphics and stock photos of shiny people, the kind of eye candy that years of shiny PowerPoint presentations have numbed us into believing is an adequate substitute for thought. Global support for Open XML is growing exponentially. Thousands of organizations have joined OpenXMLCommunity.org, hundreds of ISVs are developing solutions on Open XML, and more and more governments are opting for Choice in standards policies. Additionally, more than 10 million compatibility packs that allow users of earlier versions of Microsoft Office to work with Open XML have been downloaded around the world. The momentum is growing, the adoption is real. In this chart you see two series, one for ODF (blue) and one for OOXML (red). 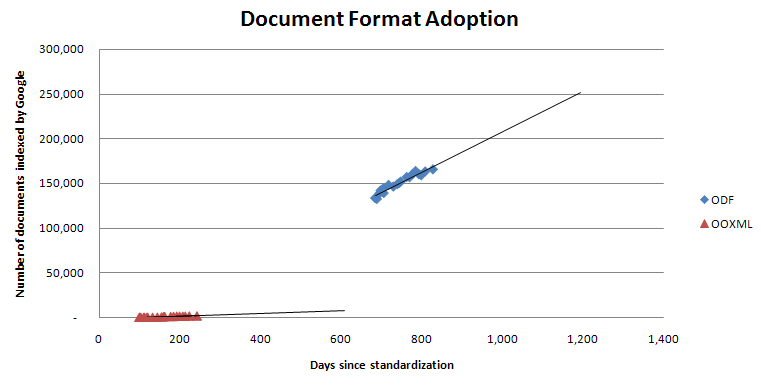 The horizontal axis shows the number of days since each standard was published, namely May 2005 for ODF and December 2006 for OOXML. The vertical axis shows the number of documents in that format on the web, according to Google, by doing “filetype” searches. For example, a query of “filetype:ods” gives you all of the ODS (ODF spreadsheet) documents on the web. Is this what you would call exponential growth? Eight months after Office 2007 shipped, and despite the claim of “10 million compatibility packs” downloaded, the OOXML line is only slowing and linearly rising (R-squared=0.943). ODF remains 100-times more prevalent on the web today and is growing 20-times faster than OOXML. So “Global support for Open XML is growing exponentially”? Uh. I don’t think so. Maybe something is growing exponentially, like the hype. But the users, the documents and the “community” — these appear to be only slowly and linearly growing. But lest you leave without some dramatic growth to think about, let me share some with you. If you recall, back in April I brought your attention to the fact that two scientific journals, Science and Nature, were both rejecting submissions from authors in OOXML format. I’ve been looking around and found an embarrassingly large number of additional journals which explicitly disallow OOXML. The Optical Society of America’s journal, Optics Letters, will not accept Word 2007 format. The American Phytopathological Society’s Plant Disease warns in bright red print [pdf], “This journal does not accept Microsoft Word 2007 documents at this time.” The American Institute of Physics, tells their authors “Word 2007 and the new Word docx format should not be used. Docx files will currently cause problems for reviewers and complicate many existing preproduction and production routines.” Vandose Zone Journal warns submitters that they cannot use the new equation editor in Word 2007 and should use MathML instead. “Word 2007 .docx format is not accepted” according to The Journal of Nutrition. I won’t claim it is exponential, but I will suggest that the most impressive growth occurring around OOXML is the number of journals that will not accept it. The Community site is irrelevant and so are their claim. However, I found the ‘Voices for Innovation’ quite funny. The problem with Astroturfing is that you need to compensate each member of your community. You cannot beat a real community. A blogger recently completed a secret survey. He posted an opinion piece with a title something like this “10 things I’m Tired of Hearing Mac Fanboys Say”. About two weeks later he followed with another piece similarly titled except with “Microsoft Fanboys” in the title. Finally he did the same with “Linux Fanboys”. The response from the Mac community numbered about 4. The response from the Microsoft community numbered about 10. The Linux response was about 75. In spite of our small numbers we clobbered the competition. I’m still trying to digest exactly why that is. I have some ideas but they need more time to peculate. It is way too clear how apple is MS’ biggest ally in this push, why are they doing this? I am also disappointed of HP, guess will have to find myself another printer developer. How many of the enormous list of journals accept ODF as fileformat? A community sites should not end with © 2007 Microsoft Corporation. All rights reserved. Communities may be hosted or they may have an ‘org’ with clearly defined rules for control of shared content. I suppose that the rules are at http://www.openxmlcommunity.org/termsofuse.aspx are reasonably clear (Microsoft makes no claim of ‘ownership’ but they do claim full rights to redistribute, exactly what is ‘owned’ is never stated. I assume that this wording is supposed to protect Microsoft from law suites over published content while simultaneously allow it to use the content for any use it sees fit.) If one commercial interest controls the copyright, I simply don’t understand how this can be considered a community web site. @vexorian: here’s my anonymous take on why Apple is MS’s ally in this. Apple does not see itself as competing with MS, even though both develop proprietary software. Apple is a hardware company that uses software as a selling point. Apple does not desire 90% of the office software market; being able to run the monopoly’s office software is a selling point. And besides, Apple primarily sells all-in-one gadgets to individuals. Apple tries (only sometimes successfully) to make up for it’s underspec’ed and overpriced hardware with sleek marketing and good design (both hardware and software design). That does not make it a big business seller. MS, on the other hand, makes up for its poor software design with various tricks I’m sure you’re familiar with. That does not make them competitors. Even though it seems like they are, sort of, every Mac sold is one less copy of Windows. Except now that Macs are intel based, that’s not completely true either. So, what Apple wants from MS is interoperability without going to the (unreliable and expensive) lengths of reverse engineering that Linux developers must (e.g. Samba, Kerberos). Apple has a full-featured product. More closed and proprietary than Microsoft’s peoples PC. Microsoft competes with Microsoft corporate pirates. The competition with Linux is just a media story but Microsoft waged an ideological war. For governments and large users of Word ODF is an utmost useful asset. They can announce their switch to OO.org and reduce Word procurement fees. OO.org is a strategic tool and needs more investment. The goal is not to actually take Microsofts market share but the threat of force. Large users of Microsoft Word should invest into OO.org development as a rational procurement strategy. How to raise political party funds? Announce your switch to OO.org. Sun can finance OO.org with petty cash. You get good press, community support and raise your trademark value. Maybe interesting business opportunities emerge as well. We need governments which say: Let’s invest some 150 Mio$ on OO.org development to make Microsoft nervous. SUN has a completely different business strategy than Apple’s. SUN sells to business and are big in servers and support (similar to IBM). SUN believes that good and widely used standards will allow them to compete on a level playing field. Free and Open Source are merely tools to that end. And that’s pretty darn good for a corporation whose purpose is to make money. As for raising political party funds…heh. I think you may be overestimating by several orders of magnitude the number of people who follow these issues. Wow! Great research, Rob. Within academia, no one wants to archive either their data or their documents on MS-OOXML. They’re not convinced, period. FWIW, I got a 60-day trial copy of MS Office and a copy of Novell SLED 10 SP1 on much the same day. Microsoft has been running off its mouth about the format converters; I’ve got a nice little test environment. Oh, and I’ve also got a copy of ACME 376! Refer to the recent INCITS vote against OOXML. There seems to be no mention of this on the MSDN blogs. Very Strange or is something brewing behind the scenes. Meanwhile some movement on ODF with Googlepack offering StarOffice free and Sun(GullFOSS) giving details of the OOXML import filter (there is no export filter) for OpenOffice. In continuation to my prev post, there was a similar brief period of silence on the MSDN blogs after the results of the ISO ballot for fast-track approval. The end result was OOXML got approval for the fast track process overriding all objections. Will we see an action replay now. It is a joke. It is well known microsoft donates money to parties and uses all means to combat open source policies. It is also known that announcing OO.org switches is mostly a procurement strategy. Back in 2002 or so German Bundestag announced a switch to Linux (of the Bundestag Pcs) which made great news and received strong grassroot support. Microsoft lobbying was almost succesful but a public affairs disaster. Parties criticised them. The defense minister had to quit and Microsoft’s public affairs company Hunzinger was ridiculed in mainstream press after internal memos got published. Hunzinger lobbying became mainstream news. Reading Bens figures I see a 200% rise for OOXML files in a period when ODF files were only 8% raising in about 3 months. Continuing that schedule OOXML files will be more prevelant on Google in 15 months or so. Since the effect is partly due to MS producing about a fifth of the growth it is probably oging o be a bit slower and in that case we could asume that OOXML will catch up with ODF in 1,5 to 2 years. Hi Wraith, remember that a begger who finds a penny on the street might double his net worth. But you can’t eat a growth rate. Let’s see where this time next year. Any predictions for how many ODF and OOXML documents we’ll see? Where are these documents? From what I could see, ODF is very popular in France, and in the smaller countries of northern and central Europe. DOCX is seeing some (very small) use in the USA and Russia, and virtually none anywhere else. Of the ODT files with known geographic locations, 70% are in Europe (including eastern Europe), 20% are in North America, and 10% are elsewhere (South America, Mexico, Asia, Africa). For this test, a total of 46 countries were selected for detailed examination. These covered most of the higher income OECD countries, plus the larger lower income countries. The relative rankings should only be taken as a rough guide, as we don’t know the actual location of a good many files. ODF documents per million people in the same top 20 countries. (which says it uses Google to get results). I won’t repeat the documents per million list for docx, as the numbers are too small to be meaningful. However, in that ranking Switzerland takes the lead as 6 docx files and a population of 7.5 million gives it a rate of 0.8 documents per million. Of those docx files for which we can find a country, most are in the USA or Russia, with Germany and the UK well behind with a couple of dozen each and no significant numbers to be found anywhere else. Of the files which can be found in the USA (239), a large percentage seem to be in Microsoft. It should not be surprising if the developers and sales team account for a large proportion of the users. The number of files in Russia seemed to require more investigation. Manual examination of a sample of the file locations seems to indicate that many of them are on personal web pages loaded with mp3 files and warez. No doubt the Russian hackers have all the latest of everything. I’m not sure I would want to download anything from those sites for detailed examination though. A similar study using ‘doc’ files is not possible, because Google only gives a very rough estimate of between 2 and 3 million documents per country. No doubt it cuts off the search after a certain point in order to not waste search resources. Update on my “test environment“. I log onto the required Microsoft Live site, and start entering details. Minor Detail: I don’t live in either the Continental US of A or any of its territories; Major detail: Microsoft is apparently not aware of anywhere else. I got my MS Office 2k7 Trial Edition off an Australian computer magazine. I wonder how many Aussies will be fuming at Microsoft now, as a direct result? Out with the footgun, Quick Draw McGraw, them (FAVOURED TERM OF ABUSE) feet are creepin’ up on youse! But then, that seems to be their entire attitude – Not Invented Here writ large. To the anonymous that tracked the source of documents by countries, thanks a lot for this informative research. I wonder what is the proportion of the ODT documents from France that come from governement agencies. Many ministries have converted to Open Office there. Are we seeing a major governement push that drags the rest of the country? The comment about academic publishers is, I’m afraid, a bit off the mark yet. It took the American Physical Society (www.aps.org) ages before they started accepting electronic submissions in Word. TeX, of course, was (and is!) vastly preferred. Indeed the APS is an extreme case, but setting up the procedure to handle a new format is, from what I gather from my onlooker’s perspective, a major task, and they would never be the first to embrace it.